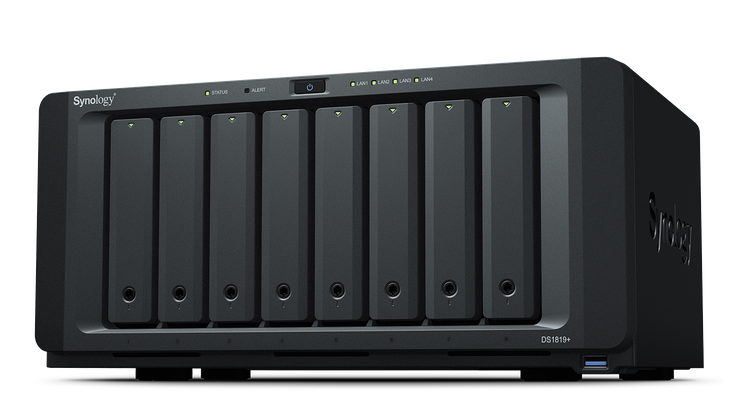 Synology has launched the DiskStation DS1819+, an 8-bay desktop NAS and the RackStation RS1619xs+, a 1U 4-bay rackmount NAS. The DiskStation DS1819+ features an Intel C3538 quad-core, 2.1GHz processor with 4GB DDR4 pre-installed memory, upgradable up to 32GB. The 8-bay desktop NAS has up to 216TB raw capacity with two expansion units, and delivers sequential throughput at over 2,045 MB/s reading and 656 MB/s writing. "This is a compact NAS with an expandable design that can be an ideal investment for small to medium-sized businesses, especially when capable of hosting versatile applications." Said Kevin Meng, product manager of Synology Inc. The RackStation RS1619xs+ features a quad-core CPU and expandable DDR4 memory up to 64GB. An optional 10GbE network adapter brings excellent sequential reading performance of over 1,523 MB/s. Built-in dual M.2 2280 SSD cache slots boost system random IO performance with NVMe/SATA SSDs. "Equipped with feature-rich collaboration applications, RS1619xs+ is ideal for small- and medium-sized businesses to improve collaboration efficiency," said Michael Wang, Product Manager at Synology Inc.
For more information, visit https://www.synology.com/products/DS1819+ or https://www.synology.com/products/RS1619xs+/.